Right now Lake Roosevelt on the Columbia River is as low as I have ever seen it. Lake level has been dropping for two reasons. The first being construction/repairs on Grand Coulee dam and the other being the large snow pack that is getting ready to melt and rush into the River. At the China Bend Boat Ramp. The water is about 250 feet from the end of the ramp! Luckily we can portage our canoes down to the water! Kettle falls from the west bank under the bridge. Although the falls are not showing, there are whirl-pools, currents, and river monsters! With such low lake levels, traveling along Lake Roosevelt provides us with glimpses of the past. Old roads, foundations, tree stumps, and even the old Fort Colville Site are all visible with the lake being so low. Most impressively, Kettle Falls and Hayes Island are beginning to show. We have paddled over Kettle Falls, which once was the largest salmon fishery in the inland northwest, but now we can actually see some of the rocks and islands that made the series of falls and drops that provided sustanance and community gatherings for thousands of years. from the Kettle Falls bridge. As John and I sat on the west bank of the Columbia River, over looking the historic Kettle Falls, we watched a beaver swim upstream, possibly looking for wood for his/her lodge. But with the lake at its lowest level since 1996, there are no trees, sticks, or logs for the beaver to build with. With the lake about 70 vertical feet lower than the riparian vegetation the beaver needs for its lodge, beavers and other animals are forced to deal with unnatural lake/river fluctuations. Imagine this, if the beaver built a lodge on the lake/river bank this past fall and winter with the anticipation of having some beaver kits this spring, the kits must now walk in places over 500ft just to get down to the water. It would be very interesting to study beaver or any animals mortality rates in conjunction with unnatural lake/river fluctuations. Kettle falls in 1860. 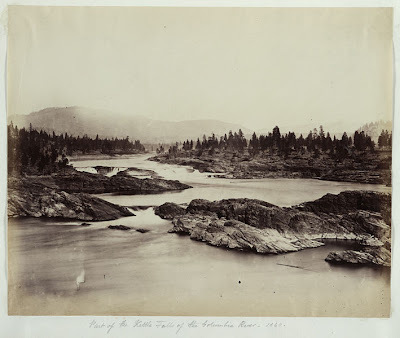 Up until the completion of Grand Coulee Dam and the flooding of the up-river valley, Kettle Falls was the primary salmon fishery and gathering area for the native peoples throughout the inland northwest. Although Lake Roosevelt is not the River it once was, having the opportunity to see Kettle Falls and the grandeur of the Columbia River valley provides me with a sense of awe and astonishment for the natural and cultural history of the Columbia River. Next week we hope to paddle through the Kettle Falls in our 25ft Birch Bark Canoe and rejoice as voyageurs in the beauty and power of the Columbia River.